A woman has died after being impaled by a branch which smashed into a car during high winds and torrential rain that battered England overnight. 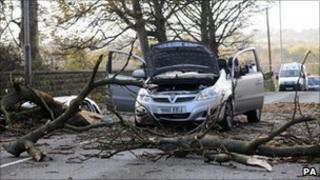 It happened on the A642 in West Yorkshire as gusts of up to 100mph were felt in parts of northern England. In Blackpool, the town's iconic tower was closed off after plastic sheeting and scaffolding fell to the ground. Planes were diverted from Leeds-Bradford and Manchester airports and a sail broke off a Lancashire windmill. The BBC Weather Centre said the winds were strongest overnight but would slowly ease off through the day. The impaled woman, who was from Pontefract and was a passenger in the car, was taken to Wakefield's Pinderfields Hospital, where she died a short time later. Police were called to the scene on the A642 - which is the main Wakefield to Rothwell route - just before 2030 GMT on Thursday. In Lancashire, the dome came off the Darwen Tower and about 40 weather-related incidents were reported to the fire service. Lancashire Fire and Rescue Service spokesman John Taylor said: "In this age of renewable energy, we had a wind turbine on a farm at Scarisbrick that got a bit too enthusiastic, and got out of control. "Our fire control section... were in touch with the manufacturers to give us some pretty detailed technical advice as to how to contain that out-of-control windmill. "The risk is... that something will break loose and obviously hit somebody or a passing vehicle and cause a worse accident, so it's a case of ensuring that doesn't happen." The dome from the Darwen Tower on Beacon Hill was blown off. One Darwen resident, who gave her name as Eileen, told BBC Radio Lancashire: "My son opened the curtains, I mean we look at Darwen Tower every morning, and the dome's disappeared - it must have been blown off." Leeds-Bradford Airport was badly affected with one flight from Dublin forced to divert to Liverpool after making three unsuccessful attempts to land. Other planes were forced to fly on to Manchester. Three flights into Manchester, from Egypt, Israel and Tenerife, had to be diverted between 2300 GMT on Thursday and 0100 GMT on Friday. Two flights were sent to Luton and the third diverted to East Midlands Airport. Greater Manchester resident, Justine Potter, from Delph in Saddleworth, said there had been an "unbelievable wind storm" in her street which had sent a beech tree "flying down across the road". A house was badly damaged by a tree which uprooted and crashed into it in Bebington, Wirral, Merseyside. In Cumbria, there were also reports of trees blown over and branches blocking roads. The east of the county saw the highest gust of wind at 100mph in Great Dun Fell at the top of the Pennines. Gusts of up to 75mph were felt in other parts of the North, which was the region worst affected by the extreme weather. However the south of England also saw damage and disruption. A Royal Navy ship was battered by storm force 10 winds in the Bristol Channel. HMS Monmouth is waiting to dock in Cardiff. In Cornwall, police were forced to close the B3269 at Sweetshouse near Bodmin after a number of trees fell. Engineers from Cornwall Council's highways department were out overnight clearing the trees and other debris. A fishing boat with a crew of four on board had to be rescued off the coast of Cromer, Norfolk, in the early hours of Friday after getting into trouble in rough seas. Two of the boat's pumps had failed and the vessel was filling with water. Yarmouth Coastguard was called and a rescue crew pumped out the water before escorting the boat back to shore.